**WORST CASE ELECTION SCENARIO: Romney wins, and Republicans Take the Senate and the House. RESULT: America moves at a rapid pace toward a theocratic police state corporatocracy. **NEXT WORSE SCENARIO: Romney wins, Republicans and Democrats each capture one house of Congress. RESULT: Democrats slightly slow down our descent into a theocratic police state corporatocracy. 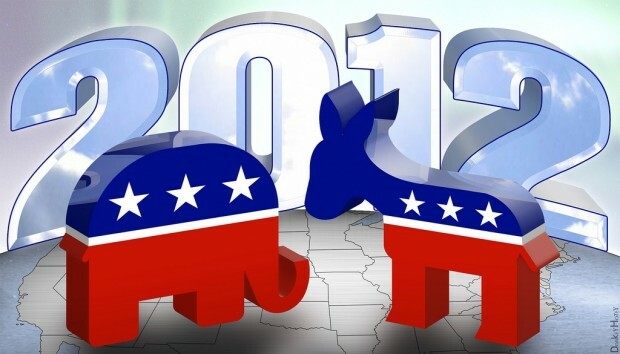 **BETTER SCENARIO: Obama Wins, Republicans and Democrats each capture one house of Congress. RESULT: As is the case now, the country continues its gradual descent into a theocratic police state corporatocracy. **BEST CASE ELECTION SCENARIO: Obama Wins, Democrats sweep Congress. RESULT: The most unlikely outcome, but if it happens the country would continue moving toward a theocratic police state corporatocracy, at a slower pace. I wish it were otherwise, but based on current political and economic conditions, the United States of America seems destined to continue its inevitable decline. Because consumerism and a rapacious economic system dominate and control our political/cultural lives, a change of course is unlikely. Because both the Republican Party (completely) and the Democratic Party (mostly) are dependent on greedy corporate benefactors, and unlimited money is the rule, the wants and desires of the average American run a distant second to the wishes of the One Percent. Until and unless money is removed as the driver of our elections and political process, which would require the passing of a constitutional amendment, the negative results of these election scenarios are inevitable. A change from this course will require an outraged citizenry taking to the streets and demanding it, which is something this country hasn’t seen since the Vietnam War era forty years ago. Until and unless conditions deteriorate to the point that the Occupy movement grows exponentially and a desperate electorate takes to the streets in massive numbers (not likely to happen this year), only then might the Owners of America (as George Carlin famously called the wealthy elite) be forced to make changes and give up some of their power. Barring that, the queasy feeling you get in the pit of your stomach thinking about this year’s election will return for many elections to come. This entry was posted in Barack Obama, Democratic Party, elections, government, inequality, Mitt Romney, Occupy, politics, protest, protests, Republican Party and tagged Congress, corporatocracy, George Carlin, police state, theocracy, Vietnam war. Bookmark the permalink. I think the best scenario for the long term is the one you chose as the worst. If Republican manage to win both Senate and House, and the White House, we will jump into the theocratic police state so fast that the people won’t be able to get slowly used to the creeping decline into it, and will actually want to do something about it. You might be right, X. An Obama, Democrat sweep would probably only lull progressives into further complacency. Perhaps we need to hit rock bottom before we can reverse course. Regardless of the outcome there is a huge mess ahead, everyone will be pointing fingers and I fear the worst. Best for people to accept personal responsibility at these times as “government” has lost compassion, and now knows only Strong-arm tactics. Here’s the actual complaint against the RNC filed on 6/11 in the US District court. Ron Paul Republicans could still SERIOUSLY affect the supposed outcome in Tampa. If nothing else this signals a STRONG shift. The question for me is this: Are, or will there ever be sufficient numbers of awakened people to TRULY begin repairing the enormous damages to which we have been complicit? I don’t know the answer to your last question, Donaldson, but good luck on the Florida action. We need to fight back, in any way we can. At the RNC the Paul delegates, many of whom are supposedly bound to Romney on the 1st ballot, vote their conscience and Paul is nominated (these delegates are NOT BOUND due to the RNC rule being illegal though never challenged – this is why delegates are being pressured to sign documents in their respective States promising to vote for Romney and why Paul is either discounted or ignored in the Media) .The RNC is/has attempted to block Paul at every turn, yet Paul has been amassing delegates despite these tactics INCLUDING MASSACHUSETTS and MICHIGAN (despite both supposedly being Romney’s “Home States). The remainder of this speculation ends here with the possibility of returning to obeisance of THE UNITED STATES CONSTITUTION …..IF…Paul were to win. Whether led by Paul, or other believers in true Liberty, this movement has grown exponentially….The question is Will it be in time and in sufficiency?